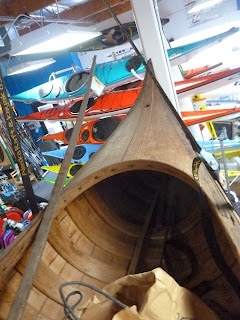 I am about to launch into another wood and canvas canoe restoration, assuming the owner is willing to spend the money. 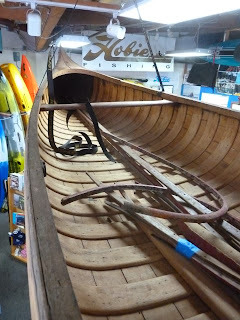 A new one of these kinds of canoes is about $4000, so anything less than $2000 for a restoration is probably a good deal. 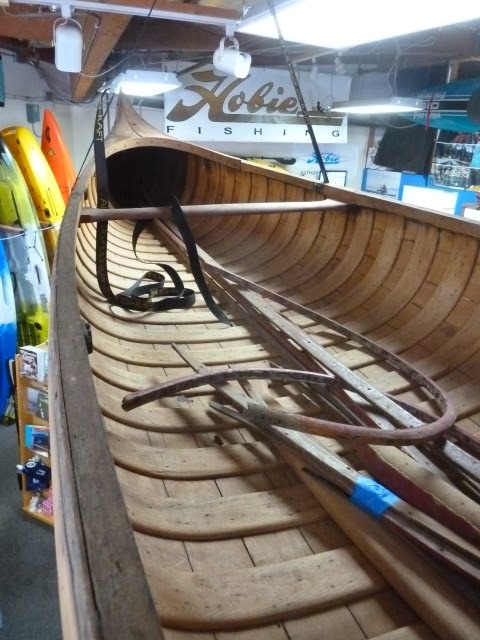 Perhaps you would pay more if the boat was an heirloom and you have some emotional connection with it. This boat looks like a good candidate. The hull is in fairly good shape. It needs some varnish stripping, some new planking, new skin, paint, interior varnish, outwales, gunwale caps, thwarts and seat restoration and seat hardware. And after all that was replaced or fixed, the boat would once again look spiffy. And of course it would have that old-timey wood, paint and brass, handmade look. The canoe minus its canvas skin. Planking is white cedar over white cedar ribs. 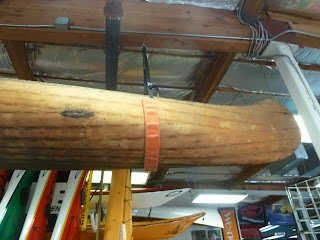 A view of the top of the canoe, partially decked in mahogany. 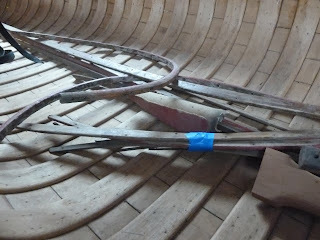 Interior view showing ribs and assortment of rotted wood trim. Closeup on the rotted trim. The curved piece at the top left is one of the exterior stems.